As the old adage goes, “April showers bring May flowers”. This is especially true in New England, where April and May are traditionally filled with plenty of rainy days. Rain, especially after a winter that brought a record-setting amount of snowfall, poses a serious threat of water damage for homeowners. Water damage in commonly dark and damp areas, such as basements and attics, is a potent recipe for mold damage. Very often, mold has a strong odor attached to it. If you smell an unpleasant odor lingering in your attic or basement, there is a good chance that the culprit is mold. Have you or your family members been suffering from sneezing, coughing, nasal congestion, a runny nose, or itchy eyes/throat? Are your symptoms noticeably more severe when you’re home? If you answered yes to both of these questions, odds are there is mold in your home. One of the biggest reasons to remove mold from your home is your health. Left untreated, mold can pose a serious threat to the well-being of you and your loved ones. Aside from allergic symptoms, if you are suffering from neurological issues, such as headaches or trouble concentrating, there may be mold in your home. Neurological problems are caused by Mycotoxins, which can negatively affect your mental health. Obviously, one of the easiest ways to detect mold in your home is to spot it with your own eyes. Mold typically grows in patches of green, gray, brown and black (more severe form of mold), but can also be white, orange, pink and purple. Of course, if you are still unsure whether you have mold in your home, you can always contact an expert for advice. 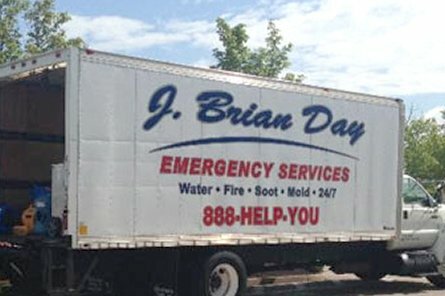 J. Brian Day offers FREE in-home mold inspection. Using the latest equipment, our team will thoroughly inspect your home for the presence of mold. If mold is detected, we will take all of the necessary steps to ensure it is completely removed from your home. We also offer air duct cleaning to optimize the air quality in your home. To learn more about our mold inspection, removal or remediation services, please contact us today!